The one on the left is Designer-hosted and the one on the right is Rebrickable-hosted denoted by the lightning bolt symbol. When you buy a Rebrickable-hosted MOC (eg on the right), things are very different. The rest of this article is only applicable to Rebrickable-hosted MOCs, which are more common. 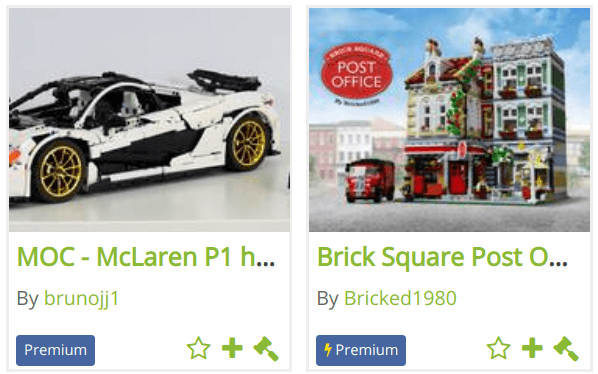 You can buy the MOC directly from Rebrickable via one of the payment methods the designer has configured. You may see PayPal and/or Credit Card options. Once paid, you will have immediate access to download your MOC instruction file(s). If you are having trouble downloading the file(s), please try again later. The links expire if you leave them open too long, and you must be logged into the account that made the purchase. However, once a file has started downloading it won't time-out unless you have network problems. If the MOC designer uploads new instructions, you will be notified. If you do not wish to be notified you can disable it from your Notifications settings.